It’s another year to celebrate America’s Great Pace, the Little Brown Jug. It means a week of local Ohio stakes mixed with Grand Circuitry, so to speak, and starring some of the season’s top start in every division. It all takes place in Delaware, Ohio, on the speedy but narrow half-mile track at the fairgrounds. 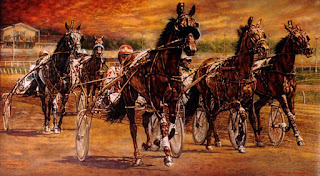 Nothing will stop the trotters and pacers participating in the fair meet; this week is a challenge for more fame than fortune and certainly a place in harness racing history. Than being said, let’s endeavor handicapping some of the races, all during the week, concluding with the long “Jug” program on Sept. 20. Let’s begin with the Jugette elim heats on Sept. 18. The Jugette is the Little Brown Jug’s sister companion, for soph-filly pacers. The two heats could be where value surfaces best, since any great-paying filly will go on to the final and be wagered upon much more than in her elim. There is little doubt that American Jewel will be all out to use her trademark speed, gunning for the top early from post 7 and pushing herself if challenged. That will be the key in the first $59,210 elim—the big choice getting challenged. There is an outsider in this group that needs to be noticed. She is Upfront Secret. Looking at her recent performances it seems she has been racing with far less class than the likes of American Jewel. However, the Scioto Downs purses are not high and you can see that she shipped to Philadelphia and won with ease, going faster than she has been able to in Ohio. Corey Callahan will drive and can add to the upset possibilities. With American Jewel leaving from the outside, being pressed to get the lead and keep it from challengers (Persistent and Bettor B Lucky may take flight early), Upfront Secret may be in a perfect spot. Whether she rides the rail or comes first over late to pass tired horses or swings from second over behind live cover, she could be the best investment in this elim. The second $59,210 elim takes on a similar situation, with the early choice, Economy Terror, leaving from post 7. I don’t understand how the morning line on Rockaround Sue could be 10-1. We feel her chances are better than that and she certainly fits into the contender category. If she can settle near the front early and not be buried by the blast of speed that seems to want to launch here from the inside out, we may be looking at a second Jugette elim longshot. Earlier in the program, soph-filly trotters go in two $51,000 divisions of the Buckette. For analysis on those races and other co-features, . Click here to get to the exclusive BreedersCrown Countdown blog. There would be no surprises if some of these won their elims, no less the second heat which caps the title. But the elims are were we can find value, so we have to deal with them. In the first elim a quirk, we think, was making Michael’s Power the morning-line favorite. The crowd should be spreading win bets out, taking shots on Bolt The Duer and Thinking Out Loud. This trio is filled with Achilles’’ heels, which is what opens up the inside two colts to upset possibilities. The rail horse, Escape The News, has suffered from awful trips that compromised his speed. The Joe Holloway-trained pacer has battled in good company and this could be the track he likes the most. To his right, Major Bombay, coming off of a two-race win streak in New York, loves the half-miles. But if he cannot shake loose while Escape The News attempts a wire job, he may be cooked. Still, both of these qualify as contenders and we can be sure their lack of star power will keep the odds juicy. In the second elim the buzz was automatic as soon as the draw was official. Most public handicappers will tell you that Sweet Lou has a mission from post 1. Though simple and obvious, the question of his being short, even on this track, is a heavy one. Also, we cannot expect A Rocknroll Dance to allow Sweet Lou an easy path to victory. From post 7 A Rocknroll Dance will be looking to use his speed early as a direct challenge for the lead or midway with a big brush. This could leave one colt to pick up the pieces: Dapper Dude. Certainly, driver John Campbell knows this course and the finicky routes to the top. Along with the style of this horse, the two are a perfect mix and certainly have the recent form to go all the way here and maybe in the second heat, too. 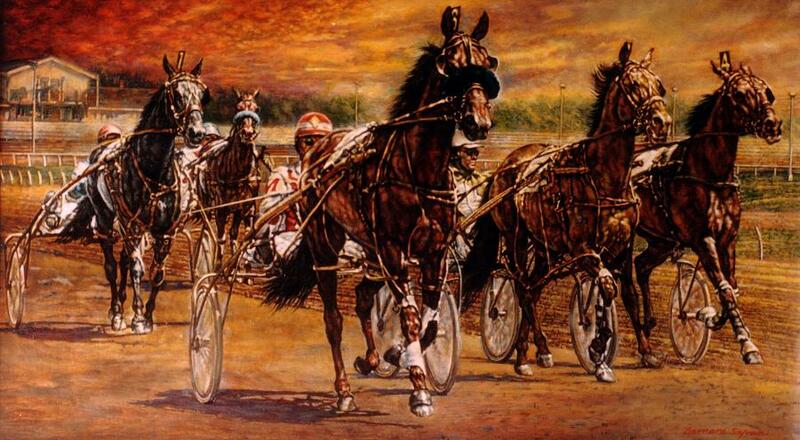 A new, free podcast on making money at the harness races is now available by clicking here.